Democrats and labor organizers spent Sunday at dozens of rallies across the country, pledging to fight in Congress against the repeal of the Affordable Care Act and any attempt to change Medicare or Medicaid. The party's leaders faced crowds ranging in size from dozens to thousands of people, urging them to call Republicans and protest the push for repeal. "Nobody's gonna shut us up! Nobody's gonna turn us around!" said Sen. Tim Kaine, D-Va., the Democrats' 2016 vice-presidential candidate, at a rally in Richmond that drew a crowd of at least 1,000. "We're standing in the breach and battling for tens of millions of Americans!" "Our First Stand," the catchall theme for the protests, represents one of the the earliest protests by an opposition party against an incoming president. Brainstormed by Sen. Bernie Sanders, I-Vt., and Democratic leaders in Congress, each rally introduced crowds to men and women who had faced death or bankruptcy before the ACA went into effect, then challenged Republicans to listen to their stories. Rattled during the ACA's passage by tea party protests and raucous congressional town hall meetings, Democrats were flipping the script. "The immediate goal of the rallies is to show Republicans that the majority of people are against repealing the Affordable Care Act," Sanders said in an interview this week. "I think people are waking up to the fact that the Affordable Care Act has been helping tens of millions of Americans," said Sen. Chris Van Hollen, D-Md., after a rally in Bowie, Maryland, organized by Maryland Democrats that drew 1,500 people. "Energizing the public around a common goal can have an important result." In Bowie, a number of rally attendees said they were also planning to join the Women's March to be held in Washington, D.C., the day after Trump's inauguration. Some lifted unofficial signs from Sanders' 2016 primary campaign; others said they had been galvanized by the election itself. Valencia Danner, 23, said that the Bowie rally was her first political event of any kind. Scott Gledhill, 73, said that he'd voted for Gary Johnson for president but was worried about Republicans' plans regarding the ACA and Medicare. "Two months after aging into Medicare, I got diagnosed with pancreatic cancer," he said. "My bill would have been half a million dollars. I would have lost everything I had, after a whole lifetime of work and saving." The rallies also demonstrated how the party's restive left is shaping its response to Trump. Some activists rallied while chastising the Democrats who had voted against an amendment to the Republicans' repeal resolution that would have made it easier to import prescription drugs from Canada. In Bowie, some of the loudest cheers came when Rep. Jamie Raskin, D-Md., said he "might end up voting to impeach" Trump, and one activist interrupted House Minority Whip Steny Hoyer and urged him to "boycott the inauguration" like Rep. John Lewis, D-Ga.
"John Lewis and I are going to be doing our job on the floor," said Hoyer, evading the question. (He is not planning to skip the inauguration.) "We had an election, and over 2 million more people voted to keep the Affordable Care Act than to repeal it." Sanders himself headlined a rally of more than 10,000 people in Michigan's Macomb County. The county, made up of suburbs of Detroit that voted for Barack Obama twice and flipped to Donald Trump, has become an emblem of the shifts that shocked Democrats and lost them the presidency. Before and after Sanders spoke, Sen. Debbie Stabenow, D-Mich., and leaders of local unions defended the ACA itself -- but then added that reform might mean something more progressive. "How about a public option? Single-payer?" said Stabenow, referring to two progressive plans that would effectively expand Medicare to younger people. "We've got things we can do." Sanders, who as a candidate called for on an ambitious, European-style reform of the health-care system, used his own speech to renew that call. Those plans were non-starters during the 2009-2010 congressional debate on health care. Since then, however, losses in conservative states and districts have moved the Democratic Party to the left, and the surprise defeat of Hillary Clinton has made Democrats question the political power of incremental, compromise-built policies. But for all Democrats, the immediate policy threat is to the existing Affordable Care Act. In Bowie, leaders distributed lists of Republicans to call and urged people to call their relatives in red states to get them to join the cause. Van Hollen suggested that repeal could be stopped entirely if three Senate Republicans could be turned against it. In Richmond, after the choir from Kaine's church sang "We Shall Overcome," the senator had the same message. He described the late-night drama of last week's budget "vote-a-rama," which saw Democrats lose vote after vote to defend the ACA. "We wouldn't sit down! We wouldn't shut up! Because this isn't business as usual!" Kaine said. "Why don't we just jump off a cliff, then we'll figure out how to land while we're in mid-air? That's what they're saying." U.S. Sen. Bernie Sanders and Michigan Democratic congressional leaders rallied in Warren this afternoon, promising to fight Republican attempts to repeal the Affordable Care Act. With Democrats in Congress outnumbered and President-elect Donald Trump headed to the White House, Sanders called on the thousands at today's rally to send a message that a repeal of the Affordable Care Act will not be tolerated. "If you want to improve the Affordable Care Act, let's work together. 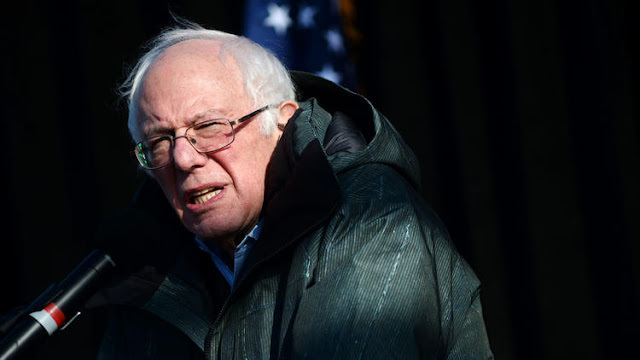 But if you think you're simply going to throw millions off of health insurance, you've got another guess coming," Sanders said at the rally outside Macomb Community College. "You're going to have to worry about millions of people who are standing up, who are fighting back and who demand the day when health care will be a right of all people, not just a privilege." With Trump's inauguration on Friday, Republicans already have taken steps to repeal President Barack Obama's signature policy initiative. Both the U.S. House of Representatives and Senate passed a resolution last week clearing the way for the Affordable Care Act's repeal. The law's repeal and replacement was a priority of Trump's presidential campaign. For the Michigan Democratic Party, holding a protest rally in Macomb County, home to the so-called Reagan Democrats, made sense. Macomb helped deliver Michigan to Trump by a wide margin after supporting President Barack Obama in the previous two elections. The crowd's largest cheer was for Sanders, who narrowly beat Hillary Clinton in Michigan’s presidential primary election in March. About 6,000 attended the rally, according to a Michigan Democratic Party spokesman who cited a figure he received from Macomb Community College police. Michigan's U.S. Senators Debbie Stabenow and Gary Peters, along with Senate Minority Leader Chuck Schumer, of New York, and others from Michigan's Congressional delegation joined Sanders at the rally. Peters urged those at the rally to get on social media and talk to friends and co-workers about their opposition to the repeal of the Affordable Care Act, which has worked to insure 20 million formerly uninsured Americans, including more than 640,000 low-income Michiganders who have received health care coverage as a part of the act's expansion of Medicaid coverage. Trump has said the law increased health care costs. "We need to generate a movement that lets the Republicans know there will be a price to pay if they repeal the ACA," Peters said. "We are going to stop this." Michael Mattingly, 56, of Hazel Park, said after the rally that he is worried about what Trump's election could mean for Medicaid, which covers treatment he receives for diabetes and for his recovery from a stroke he suffered about a year and a half ago. "When they repeal this ACA, what's going to happen next?" Mattingly said. Angela Anderson, 46, of Oak Park, said she is angry that accessible health care is about to be dismantled. "There is no compassionate viewpoint about what matters most to the everyday person, even though that was the bill of goods that was sold by the president-elect," Anderson said. While preserving the Affordable Care Act as it now exists seems unlikely, both Sanders and Stabenow said Democrats can shape the discussion on health care going forward. "How about a public option?," Stabenow said. "But they just want to rip it away and create chaos for every family and that is wrong." Thousands of people showed up in freezing temperatures on Sunday in Michigan where Sen. Bernie Sanders called on Americans to resist Republican efforts to repeal President Barack Obama’s health care law, one of a number of rallies Democrats staged across the country to highlight opposition. Lisa Bible, 45, of Bancroft, Michigan, came to show support for the law. She said that she has an auto immune disease and high cholesterol. She says the existing law has been an answer to her and her husband’s prayers, but she worries that if it’s repealed her family may get stuck with her medical bills. “I’m going to get really sick and my life will be at risk,” she said. President-elect Donald Trump has vowed to overturn and replace the Affordable Care Act and majority Republicans in Congress this week began the process of repealing it using a budget maneuver that requires a bare majority in the Senate. He has been one of the strongest advocates for the law, which has delivered health coverage to about 20 million people but is saddled with problems such as rapidly rising premiums and large co-payments. Sanders made several visits to the state last year during the Michigan primary and defeated Hillary Clinton in the state. But in a major surprise, Michigan narrowly voted for Trump on Nov. 8, the first Republican presidential candidate to carry the state since 1988. Mark Heller, 45, a civil rights, immigration and labor attorney who drove to the rally from Toledo, Ohio, said that stopping Republicans from repealing the law may take more than attending rallies. Republicans want to end the fines that enforce the requirement that many individuals buy coverage and that larger companies provide it to workers. They’d like to expand health savings accounts, erase the taxes Obama’s law imposed on higher-income people and the health care industry, eliminate the subsidies that help people buy policies and pare back its Medicaid expansion. 0 Response to "Democrats rally across the country to save and expand Obamacare"